• Desert tortoises can live up to 100 years. • They require a secure, fenced habitat free of dangers like unfenced pools or dogs. • That habitat must include an insulated shelter allowing the tortoise to escape extreme temperatures. • Tortoises can get sick just like any other pet. Be sure you’ll be able to provide the necessary care. • It helps if the habitat offers vegetation like grass or native plants. It’s a rainy morning when tortoises at the Adobe Mountain Wildlife Center are taken from their dens for health evaluations. The sleepy, muddy creatures might not be too happy with the wake-up call, but any indignities are preparing them for a new chapter in their long lives. After a quick bath to get the mud off, they are ready for a checkup that includes looking for parasites or diseases, as well as any abnormalities in the eyes, ears, nose or throat. The evaluations will prepare these tortoises for the Arizona Game and Fish Department’s annual Tortoise Adoption Program, set to begin April 1. Desert tortoises are protected and can’t be collected from the wild, but many wind up with Game and Fish because of breeding among captive tortoises or because owners can no longer care for them. That commitment can last from 50 to 100 years given the lifespan of desert tortoises. 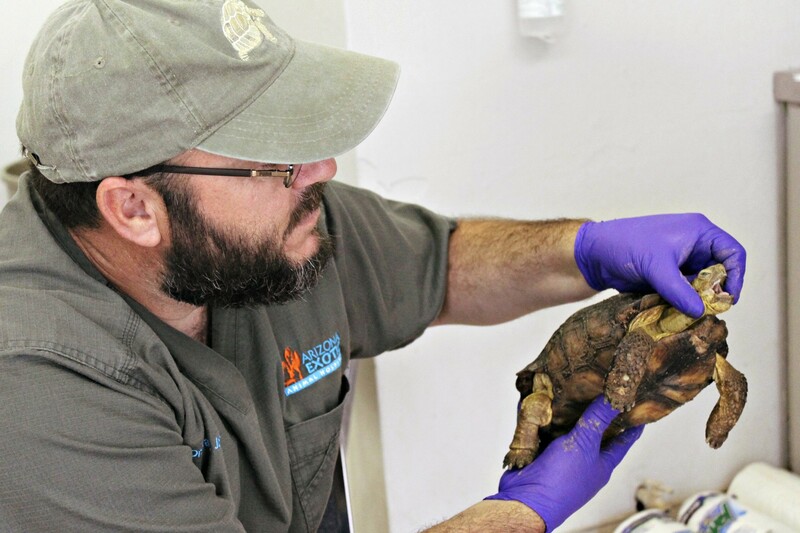 Jay Johnson, owner of Arizona Exotic Animal Hospital, volunteered his time to the cause. 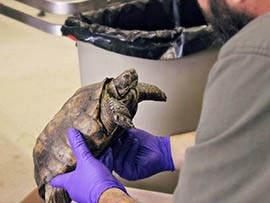 He often works with desert tortoises, helping out agencies like Game and Fish. One had a dent in its shell, though Johnson noted that it had healed. Johnson checked approximately 70 tortoises, all in various stages of growth and age. Individual boxes prevented the tortoises from contacting each other and potentially sharing diseases. Those diseases are part of the reason that the creatures can’t simply be released into the wild. Tegan Wolf, tortoise adoption specialist for Game and Fish, said that releasing tortoises born in captivity would put wild tortoises at risk. And even if a captive tortoise is healthy, there’s no way to tell whether or not it could survive in the wild. “It’s kind of the same with any reptile: If you don’t know where it originally came from, and if you release it to a place it’s not familiar with, there’s a big chance that it’s going to die,” Wolf said. That’s where people like Scottsdale resident Warren Wen come in. Wen, who said he has loved tortoises and turtles since he was young, created a habit at his home for five adopted desert tortoises. Adoptive homes must offer burrows for tortoises to escape extreme temperatures, as well as enclosed areas for them to roam. Dogs and unfenced pools are out. Wen said tortoises are easy to take care of and perfect pets for those with busy schedules. All someone needs to offer is vegetation such native plants and Bermuda grass, which he said they love to eat. For Warren Wen of Scottsdale, desert tortoises are perfect pets for those with busy schedules. He has adopted five of them from the Arizona Game and Fish Department. 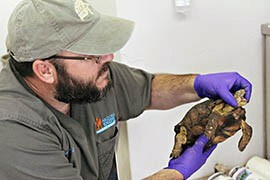 Jay Johnson, owner of Arizona Exotic Animal Hospital, examines a desert tortoise that will be offered for adoption by the Arizona Game and Fish Department. 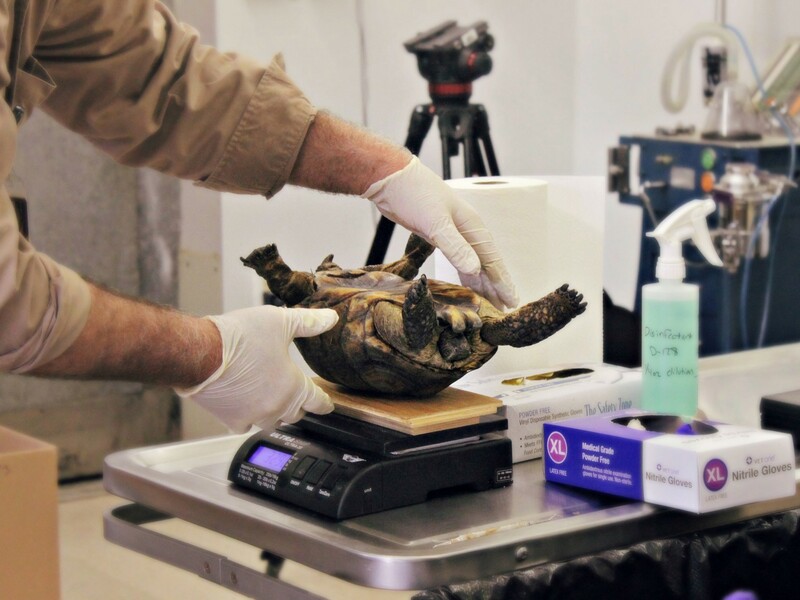 A desert tortoise set to be put up for adoption by the Arizona Game and Fish Department is examined for physical abnormalities and signs of disease. A desert tortoise is weighed as part of an health checkup required before the Arizona Game and Fish Department offers it for adoption.